Busby, J.W., Monten, J., Tama, J. and Imboden, W. (2013) Congress is already post-partisan: Agreement across the aisle on U.S. foreign policy. Foreign Affairs 28 January, http://www.foreignaffairs.com/articles/138791/joshua-w-busby-jonathan-monten-jordan-tama-and-william-inboden/congress-is-already-post-partisan, accessed 19 June 2014. 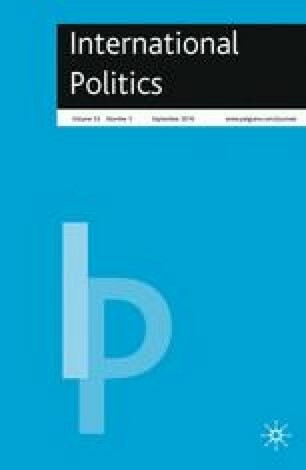 Busby, J.W., Monten J., Tama, J. and Imboden, W. (2012) American foreign policy is already post-partisan: Why politics does stop at the water’s edge. Foreign Affairs 30 May 2012, http://www.foreignaffairs.com/articles/137669/joshua-w-busby-jonathan-monten-and-william-inboden/american-foreign-policy-is-already-post-partisan, accessed 19 June 2014. Gallup. (2012) Obama ratings historically polarized. 27 January, http://www.gallup.com/poll/152222/obama-ratings-historically-polarized.aspx, accessed 14 December 2012. Shapiro, R. and Bloch-Elkon, Y. (2005) Partisan conflict, public opinion, and U.S. foreign policy. Paper presented at the Inequality & Social Policy Seminar, John F. Kennedy School of Government, Harvard University, Cambridge, Mass., 12 December http://www.hks.harvard.edu/inequality/Seminar/Papers/Shapiro05.pdf, accessed 25 October 2012. Voteview.com (2012) An update on political polarization (through 2011). 30 January, http://voteview.com/blog/?p=284, accessed 12 December 2012. Voteview.com (2014) The polarization of the congressional parties. 19 January, http://voteview.com/political_polarization.asp, accessed 17 February 2014.